Tang funerary vessels often contained figures of merchants. warriors, grooms, musicians and dancers. There are some works that have Hellenistic influences that came via Bactria in Afghanistan and Central Asia. Some Buddhas of immense size were produced. None of the tombs of the Tang emperors have been opened but some tombs of the royal family members have excavated, Most of them were thoroughly looted. The most important finds have been murals and paintings in lacquer. They contain delightful images of court life. Proto-porcelain evolved during the Tang dynasty. It was made by mixing clay with quartz and the mineral feldspar to make a hard, smooth-surfaced vessel. Feldspar was mixed with small amounts of iron to produce an olive-green glaze. Tang- and Five Dynasties-era paintings in collection at National Palace Museum, Taipei include: 1) "Emperor Ming-huang's Flight to Sichuan", Anonymous; 2) "Mansions in the Mountains of Paradise" by Tung Yuan (Five Dynasties); and 3) "Herd of Deer in an Autumnal Grove", Anonymous. Works of calligraphy from the same period in the museum include: 1) "Clearing After Snowfall" (Wang Hsi-chih, Chin Dynasty); and 2) "Autobiography" by Huai-su, (T'ang Dynasty). During the Tang Dynasty both figure painting and landscape painting reached great heights of maturity and beauty. Forms were carefully drawn and rich colors applied in painting that were later called "gold and blue-green landscapes." This style was supplanted by the technique of applying washes of monochrome ink that captured images in abbreviated, suggestive forms. During the late Tang dynasty bird, flower and animal painting were especially valued. There were two major schools of this style of painting: 1) rich and opulent and 2) "untrammeled mode of natural wilderness." Unfortunately, few works from the Tang period remain. Lovely murals were discovered in the tomb of Princess Yongtain, the granddaughter of Empress Wu Zetian (624?-705) on the outskirts of Xian. One shows a lady-in-waiting holding a nyoi stick while another lady holds glassware. It is similar to tomb art found in Japan. A painting on silk cloth dated to the A.D. mid-8th century found in the tomb of a rich family in the Astana tombs near Urumqi in western China depicts a noblewoman with rouge cheeks deep in concentration as she plays go. Famous Tang dynasty paintings include Zhou Fang's “Palace Ladies Wearing Flowered Headdresses,” a study of several beautiful, plump women having their hair done; Wei Xian's The Harmonious Family Life of an Eminent Recluse, a Five Dynasties portrait of a father teaching his son in a pavilion surrounded by jagged mountains; and Han Huang's Five Oxen, an amusing depiction of a five fat oxen. Celebrated painters included Han Gan, Zhang Xuan, and Zhou Fang. The court painter Wu Daozi (active ca. 710–60) was famous for his naturalist style and vigorous brushwork. Wang Wei (701–759) was admired as a poet, painter and calligrapher. who said "there are paintings in his poems and poems in his paintings." Emperor Minghuang Playing Go by Zhou Wenju (ca. 907-975) is a Five Dynasties period (Southern Tang), Handscroll, ink and colors on silk (32.8 x 134.5 centimeters): According to the National Palace Museum, Taipei: “ The subject here is attributed to the Tang emperor Minghuang’s (Xuanzong, 685-762) fondness of playing "weiqi" (go). He sits on a dragon chair by a go board. A man in red goes to discuss a matter, his back adorned with a jester, suggesting that he is a court actor. The coloring here is elegant, the drapery lines delicate, and the figures’ expressions all fine. The Qing emperor Qianlong's (1711-1799) poetic inscription criticizes Minghuang for his infatuation with the concubine Yang Guifei, attributing his eventual neglect of state affairs for the calamities that befell the Tang dynasty. Scholarly research also suggests this handscroll may depict Minghuang playing go with a Japanese monk. The old attribution is to the Five Dynasties figure painter Zhou Wenju, but the style is closer to that of the Yuan dynasty artist Ren Renfa (1254-1327). Pioneering calligraphers in the Han dynasty created styles that became models for later calligraphers.Wang Hsi-chih (Wang Xizhi AD 321-379), the Sage of Calligraphy, is often regarded as master of the flowing semi-cursive script. His original manuscripts were greatly coveted by a the 7th century Tang Emperor Taizong who tried to obtain them by trickery from monk who was sworn to destroy them. Taizong so admired Wang's work he took the calligrapher's famous “Preface to the Gathering at the Orchid Pavilion” with him to his grave. Wang's son Wang Hsien-chih (Wang Xianzhi, 344-386) was also a great calligrapher. 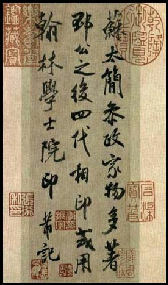 Tang era calligraphy is known for both its powerful court styles and experimental new styles. Although the Tang period is closely associated with the standard script as a result of its being adopted by the court, other types continued to be in use. Taizong reportedly tried to obtain the original manuscripts of Wang Xizhi by trickery from monk who was sworn to destroy them. Taizong so admired Wang's work he took the calligrapher's famous “Preface to the Gathering at the Orchid Pavilion” with him to his grave. Chang Hsu from the mid-Tang period is famous for his "tipsy" cursive that provided an alternative to the classic style of Wang His-chih. Whenever Chang painted when he was drunk it was said that his brushes flied and danced with unbridled emotion. Huai Su was even less restrained than Chang Hsu. He was famous from his extremely fluid and spontaneous "wild" cursive. Wang Wei (701–759) was admired as a poet, painter and calligrapher. who said "there are paintings in his poems and poems in his paintings." Yu Shinan and Ouyang Xun were famous calligraphers in Taizong’s court. They served as tutors to the sons of nobility and as scholars of rank in the Palace library and Institute for the Advancement of Literature, respectively. The characters in their calligraphy was regular script. Both precision and spontaneity were required to make high-quality works. Mogao Grottoes (17 miles south of Dunhuang) — also known as Thousand Buddha Caves — is a massive group of caves filled with Buddhist statues and imagery that were first used in the A.D. 4th century. Carved into a cliff on the eastern side of Singing Sand Mountain and stretching for more than a mile, the grottoes are one of the largest treasure house of grotto art in China and the world. All together there are 750 caves (492 with art work) on five levels, 45,000 square meters of murals, more than 2000 painted clay figures and five wooden structures. The grottoes contain Buddha statues and lovely paintings of paradise, asparas (angels) and the patrons who commissioned the paintings. The oldest cave dates back to the 4th century. The largest cave is 130 feet high. It houses a 100-foot-tall Buddha statue installed during the Tang Dynasty (A.D. 618-906). Many caves are so small they can only can accommodate a few people at a time. The smallest cave is only a foot high. A total of 243 caves have been excavated by archaeologists, who have unearthed monk's living quarters, meditation cells, burial chambers, silver coins, wooden printing blocker written in the Uighar and copies Psalms of written in the Syriac language, herbal pharmacopoeias, calendars, medical treatises, folk songs, real estate deals, Taoist tracts, Buddhist sutras, historical records and documents written in dead languages such as Tangut, Tokharian, Runic and Turkic. Mogao was a major center of Buddhist scholarship and a trading post on the Silk Road for more than a thousand years, until 1372 when the Chinese withdrew their garrisons and the area was taken over by the Mongols. The caves were largely abandoned after that. "Unlike Indian Buddhists, the Chinese wanted to know in detail all the forms of the afterlife," says Zhao Shengliang, an art historian at the Dunhuang Academy. "The purpose of all this color and movement was to show pilgrims the beauty of the Pure Land---and to convince them that it was real. The painters made it feel like the whole universe was moving." In 1900, the priest Wang Yuanku discovered the famous Hidden Library, a trove of 50,000 documents, including the Diamond Sutra, the world's oldest book. In 1907, the British-Hungarian archeologist Sir Aurel Stein paid Wang four silver pieces and hauled off thousands of manuscripts, silk scroll paintings and wood slips, and the Diamond Sutra out of China. These are now housed in the British Museum, the British Library and the National Museum in New Delhi. “The north and south slopes depict two immortals traveling in heaven and escorted by a procession. The one on the south slope, riding in a four-phoenix chariot, is identified as the Western Mother Queen who existed a long time ago in Chinese mythology. The one on the north slope, riding in a four-dragon chariot, is the Eastern King who appears much later than the Queen. Originally they were described as half-human and half-beast creatures, and then humanized as royalty. According to legend, they meet once a year, but are not clearly described as husband and wife. They are in charge of everything in heaven and earth. If one can see them, it means one has attained immortality. The popularity of their images began in the Han dynasty (206 BC-220 AD).